It’s taken me a while to get this post together—had to set up my scanner in my new place, not to mention finish the coloriages! 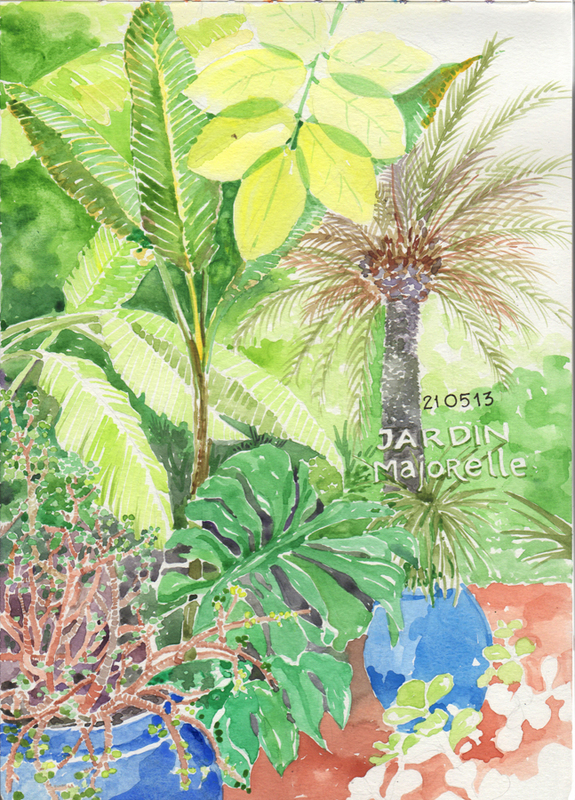 Martine Chabas, a fellow artiste and someone who knows her way around Morocco, planned a “Stage de Dessin à Maroc” among a few friends, with me guiding with regard to drawing and watercolors. We stayed in her comfortable Marrakechi Riad (a Riad is a traditional Moroccan home, build around a central courtyard), and made forays in and out of the Medina, for a week. The Riad provided a peaceful refuge from the hubbub of the town, and we ate, relaxed and drew in the courtyard, which is open to the sky. A family of Tibibts (Emberiza striolata) also took refuge there and we watched as the young birds learned to fly and roosted on the lamps. Our base was in the center of the Medina, a minute of two away from the hive of the Souk. The five of us were constantly tempted into various purchases since we usually traversed the Souk on our way home. One thing I can say about Moroccans is that they LOVE ornament. Most everything has some kind of decoration, and I felt over stimulated as my eyes were pulled here and there by intricate designs, whether executed in leather, tile, metal, wood or plaster. Of course, in order to have so much beautiful stuff to look at, you need skilled craftsmen, and we marvelled at all the clever hands (and feet!) at work. Our first drawing excursion was to the Bassin de Menara, originally built in the 12th century for the purposes of irrigating the gardens and olive groves. The water, which comes from the Atlas mountains visible in the background still irrigates the olive trees. The 16th century pavilion was built as a summer resort. We didn’t visit the pavilion, but sat on the ground as Sunday holiday makers walked by, commenting on our drawings. It was quite a cheery venue, with children, herded by youthful camp councillors, singing boisterously. One of the kids asked if I’d put the number of his favorite football idol into my painting, so I did. We did some site seeing as well, visiting the impressive and dignified 14th century Ben Youssef Medersa Koran school. Apparently, this was a school enrolled through merit-assessing exams, so it was not only the elite who attended. And it was a center for all sorts of education, not religious studies alone. The dormitories are quite beautiful, punctuated with small interior courts and a labyrinthian floor plan. We also visited the Bahia Palace, where we were again confronted with this labyrinthian approach to the layout of rooms. Maybe I am making a metaphorical leap about the Arab culture, but the complicated interior spaces—usually without windows, and often interconnected (that is, with two points of egress, so the rooms lead one to another, rather than creating our own more familiar room segregation) seemed to indicate a more private and intricately-involved perspective on Life. As I said, lots of stuff to look at. And eat. Mostly, afraid of getting tourists’ sickness, we ate Tangines and couscous. 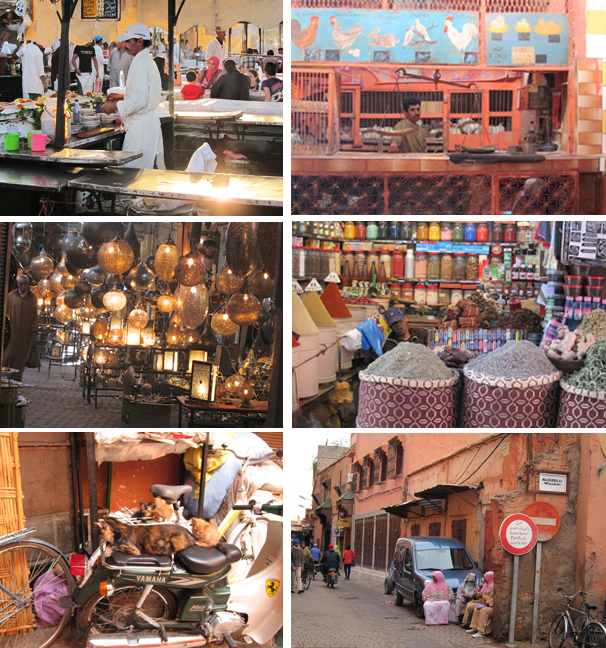 I also want to note that, messy and cluttered as Marrakech was, mostly it was fragrant. Morocco is famed for its spices and perfumes, and of course the mint, which goes into their ubiquitous tea. Our daily excursions into the public spaces gave us a fine view of the population and its variety. One day we just drew the people from the street level in the famous Jemaa el Fnaa plaza. One day we perched from the terrace of the Café de France and looked down on the theater that is the Plaza at any time of day. I loved drawing these old guys, who were taken aback when they discovered us sitting on their bench at the hour of their daily philosophising rendezvous (of course, we deferred to their obvious precedence to the spot). I put (hope my calligraphy is ± accurate!) a poignant saying pointed out to us in carvings ringing one of the rooms at the Bahia Palace: “Time & Good health — once gone; never to be regained”. Just a reminder of what’s important in life. Another famous monument is the Koutoubia Mosque, which, as the biggest mosque in Marrakech, contributes its drama to the skyline. It was built in the 12th century, with a drole history: Halfway through its construction, someone realised that it was misaligned with regard to Mecca. As a designer, I feel for the architects responsible for the terrible mistake. And though they built an identical mosque next door, slightly reoriented (literally, as I recognise the real reason for the word), the second mosque was even more out of alignment. I guess the devout just take out their protractors and adjust their prayer rugs accordingly. Of course, like all the rest of the French tourists, we had to visit the famous Majorelle Gardens, originally built by the artist Jacques Majorelle, then restored by Yves St Laurent. The site provides a lush tropical counterpoint to the usual dry and dusty Marrakechi cityscape. In a way, the dense jungle of the gardens makes one more variation on the secret spaces within the city. We took a break from the city on Wednesday, hiring a taxi to take us up the Ourika Valley, which leads up to the Atlas mountain range, and brings water to the town. We visited picturesque Setti Fetma, and lunched on the river, which was lined with comfortable restaurants. 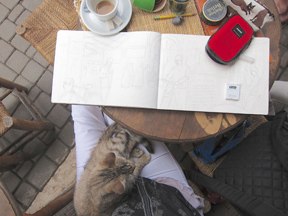 We were grateful that, as always in Morocco, the restaurateurs let us hang around for hours to draw after eating. It was cherry season and men in the trees above us handed down free cherries for our dessert. After lunch we walked up to the Berber hamlet. I was shocked to see the women of the village doubled over, laden with hay with nothing more ergonomic than a nylon rope to hold the burden to their backs. I felt uncomfortable ogling them, and surreptitiously took their photo from behind. Often, in Morocco, I saw people, mostly women, in positions I felt were demeaning. Naturally, these people did NOT want to be photographed by a Western tourist, who was plainly passing a negative judgement on their humiliating—to my eyes—position. I was glad to see at least one man carrying a load (the restaurants straddle the river, & goods need to be taken across), since it looked like most of the guys in this village were just hanging out chatting. Our drawing workshop wound to a close, and all but Martine & I got on their respective planes (just like the one I drew from the Menara basin) and returned to France. There was one more treat for me though: A little far for a day trip, but perfect for an overnight stay is the picturesque and ancient town of Essaouira. Originally called Mogador, (which is the name of an offshore island protecting the harbour) and, as a strategic town on the coast, the site for plenty of raids and bombardments, it being a key vertex for much of the famed Triangular trade we learned about in 8th grade. Essaouria is ribboned with turquoise and cobalt doorways, lintels, shutters and other architectural decoration. The town is famous for the production of indigo, created with the Hexaplex trunculus sea snail. The color goes very prettily with the whitewashed walls. The day were visited, the strong trade wind, L’Alizé, was blowing, as it often does, on the African Atlantic coast. Because the wind was coming from the Northwest, and we were oriented on the West Coast of the continent, I was strongly reminded of the San Franciscan nautical climate: i.e. I was pretty cold, and had no desire to swim in the uninviting, choppy sea. The fish market is impressive in Essaouria, and, though it was a bit disturbing for me to see so many dead animals, I appreciated the sparkling beauty of the very fresh fishes. In the typically Morrocan way, many were displayed in pleasing arrangements. I noticed that, naturally, the cats of Essaouira were in much better shape than their brethren in the inland town of Marrakech. Our hotel was really delightful, with those sensuously smooth Tadelakt walls, and a view of the sea. The roof terrace, where we breakfasted, also was a terrific spot to sketch the town. I came home the following day, with a suitcase full of treasures, including a beautiful leather pouf my students presented me with, enough tassels to adorn the most festooned of exotic dancers (I’m just hanging them from drawer pulls), enough soap to last me for five years, a pretty necklace and earrings and (heavy—I had to reorganise my stuff at the airport to conform to Ryan Air’s strict weight regulations) lustrous platter and bowls. Also, a few recipes for those delicious tangines and vegetable dishes we enjoyed. wonderful drawings I would love to realize by myself ! Grâce à toi je viens de faire un voyage au Maroc en restant dans mon salon. C’était très agréable, tes dessins sont vraiment parlants. Tout les détails nous transportent là bas. Je suis vraiment contente que ce voyage t’ai plu. Tu n’as peur de rien, à peine arrivée en France et pas encore installée, tu pars pour un autre pays totalement inconnu. Total respect comme ils disent ! Thank you Diana for sharing your experience, offering us your beautiful drawing-paintings and interesting comments to go with. You are definitely inspiring and I deeply and endlessly admire your skills. You do make us all want to go to Morocco! What beautiful images. Thank you for taking us to Morocco! Such gorgeous drawings and transporting narrative! You have such amazing talents! Quel talent!Le Maroc a une belle âme à travers tes yeux et tes mains! On sent la lumière…Merci! !